Fed's bust Medicare scam that cost taxpayers nearly $1 billion. Action is being taken following a Troubleshooter I-Team investigation into medical braces being sent to seniors that they say they didn't want or order, yet Medicare paid for the braces. On Tuesday, the federal government took action against several telemedicine companies, dozens of durable medical equipment companies, along with doctors and company executives that the feds say were part of one of the largest health care fraud schemes that cost taxpayers nearly $1 billion. We first told you about this scam in October. Several seniors reported to us that they continued to get medical braces in the mail that their doctors didn't prescribe for them. Medicare did pay for these braces, despite these seniors telling us they did not order the braces and didn't want them. We tracked down that these braces were prescribed by several telemedicine doctors and companies. In one case, Raleigh resident Emmett McGhee was sent two knee and two back braces. "I didn't order nothing," he said. When Emmett got the paperwork on who prescribed the braces it was a nurse practitioner in Belmont, NC. According to the paperwork, Heintz justified the prescription in her examine notes. It states McGhee complained of back and knee pain and wanted to use an orthotic brace. It went on to say McGhee said it was 10/10 for knee and back pain. The notes said Emmett was a female who was 65 inches tall and weighed 120 pounds. Remember Emmett is a male, not a female as Heintz's examine notes stated. "I don't know, looks to me like it's just an intentional rip-off is what it looks like," Emmett said. At the time of our investigation, Medicare told us they were investigating. On Tuesday, investigators said 24 people were charged in the fraud, including Doctor Randy Swackhammer of Goldsboro. He's charged for an alleged $5 million conspiracy to commit health care fraud that involved writing medically unnecessary orders for DME while working for a telemedicine company, in many instances with only a brief telephonic conversation with the patients. Often how this scam starts is with a phone call that claims you might qualify for medical grade braces. 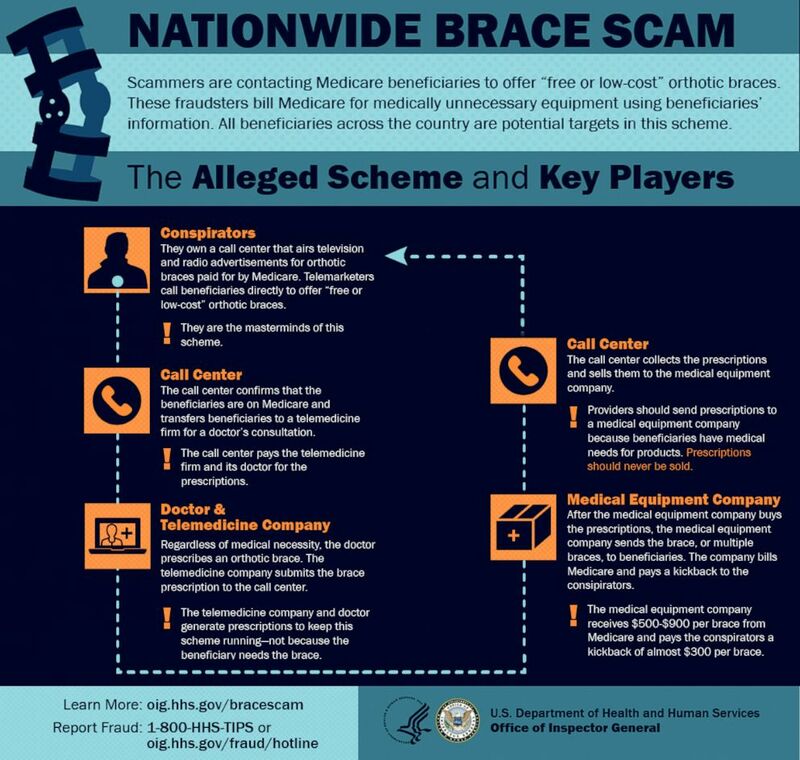 Investigators say the scam relied on telemarketers who called senior citizens who had Medicare and promised a free or low-cost brace. If the caller got a person's insurance information, the companies would bill Medicare and mail the patients unnecessary orthotic braces, and then investigators say give kickbacks to the doctors who wrote prescriptions over the phone. "Unscrupulous doctors, unscrupulous durable medical equipment company owners, these marketing firms, their only interest is in the paycheck -- is in that taxpayer dollar that's being stolen," said Gary Cantrell, deputy inspector general for investigations of the Department of Health and Human Services Office of the Inspector General.